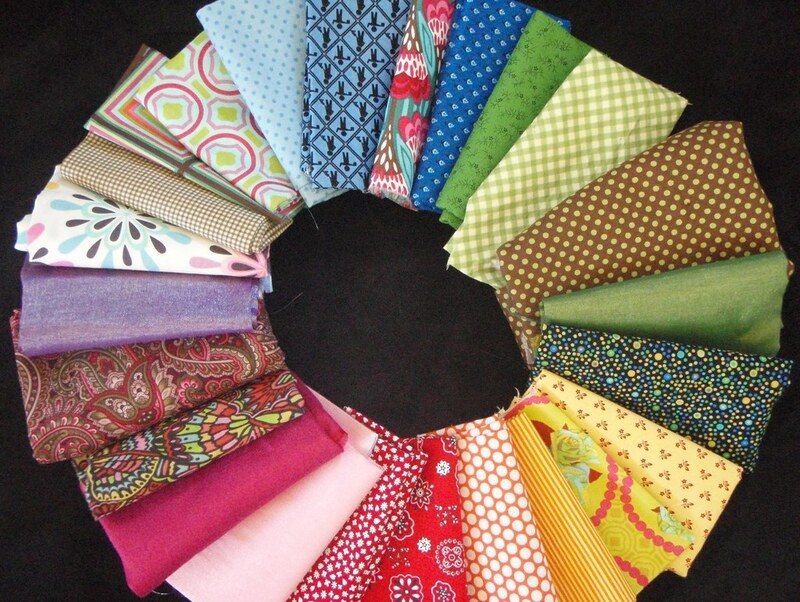 This is the sixth day of Mike's lovely Share Your Fabric Stash. Today's selection, didn't quite fit into previous days' posts. They are motley bunch: various sizes and colours. I love them all. The beautiful paisley cotton was a treasured birthday gift. The stained glass a precious scrap of Liberty. The blue FQ with the workman a prize find at a discount store. They all have their own little histories and some have destinations. The brights are are shortly teaming up to become construction equipment appliques. Thank again to Pip for the idea of sharing our stashes - its been great fun (... and prompted me to reorganise the uproar that I call my stash). I'm absolutely digging all of these and I love the colour wheel presentation. Great shot of your fabrics! Now they are all just lovely...I love patterned brights. Thanks for sharing your stash - I feel like I've been rummaging through peoples' cupboards - it's been great! Oh, they all look so great. All this rummaging through fabrics has inspired me to get making! Let's see if it translates to actions, if not I'm so glad for the opportunity to admire everyone's collections. Ive loved looking at yours and everyone elses stashes - I think there is some serious sewing to be done out there - hope you get to those planned destinations (and perhaps some unplanned ones too). Now I dont feel so bad about my ever increasing pile of lusciousness. Oh look how beautiful they look all laid out like that.